If you need a business card, flyer or print advertisement, let The Rusty Pixel create an eye-catching design that will get you noticed. We provide specialized creative design and printing services for all kinds of projects – both large and small. Let our experienced team make you a customized graphic design or printing. 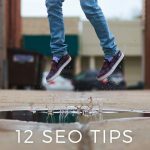 We also know the importance of creating a clean, streamlined design that conveys your message and image while avoiding unnecessary clutter. At The Rusty Pixel we consider each project a unique piece of art that conveys an important message about your business, product or service. 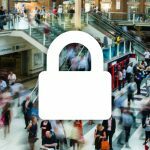 We can do just the design, just the printing or both and have done everything from business cards to billboards. So contact us today for help with your next print project. Check out some examples of our previous print design work. This is a custom front and back business card design for Collision Machinery Services. 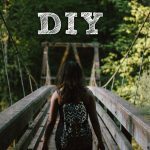 They specialize in service and repair of all frame equipment; located in Titusville, Florida, they have been a client since 2011. The business card design features their logo on the front with general contact details on the back. The style is done in a metallic and futuristic look and feel. The business cards were printed at 14pt card-stock and glossy finish. 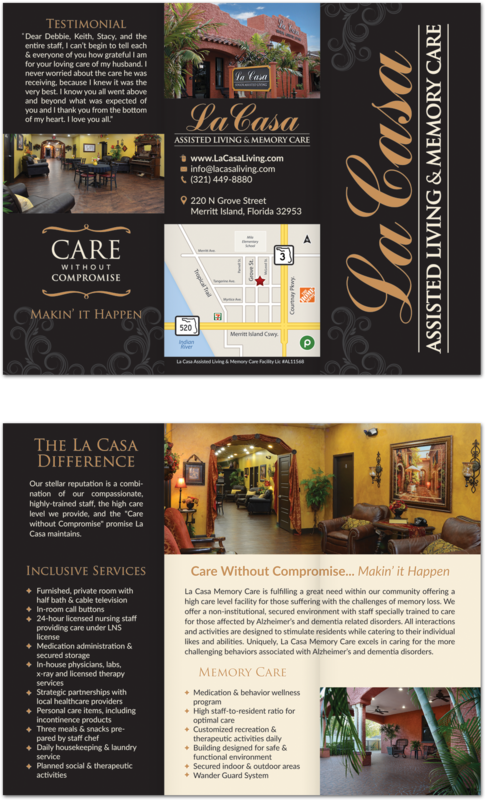 This is an outside and inside tri-fold brochure 100% customed design for La Casa Assisted Living. The design features their logo large on the front of the trifolds; on the back there is a map along with their contact details. 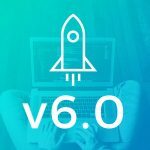 The inside of the design features more information about their business along with bullet-points of their various services. The style of the tri-fold designs is done in a premium and upscale look/feel. An assisted living senior care facility they are located on Merritt Island, FL and have been a client since 2014. 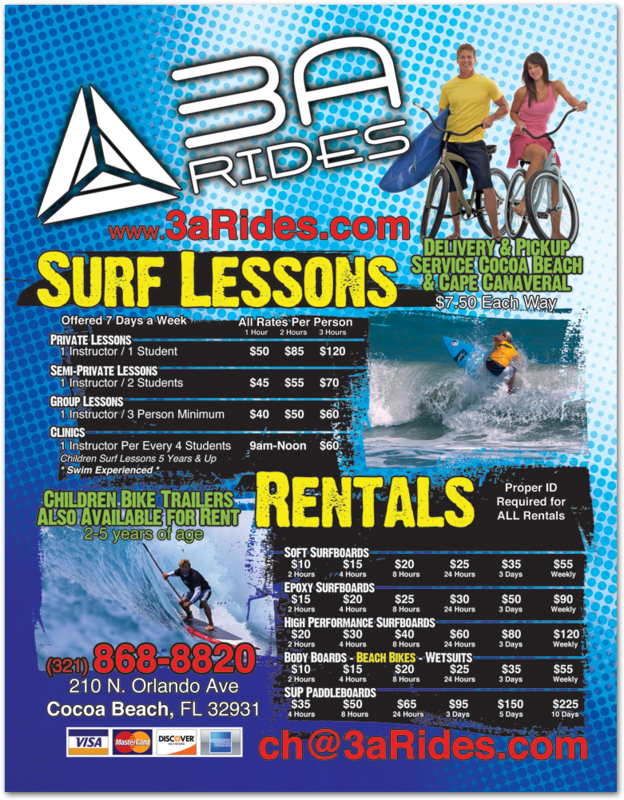 This is a custom front-only flyer design for 3A Rides; a surf shop located in Cocoa Beach, Florida that has been a client since 2010. This flyer design features information and pricing for their surf lessons and rental services. The design is done in style that perfectly captures the surf lifestyle prevalent on Florida’s coastal communities. This is a front and back postcard design custom created for DCS. The design features company information on the front along with contact details. The back of the postcard features their logo, bullet-point list of services and a place for the address to be written along with a stamp. The 100% custom design is done in a modern and technology style. 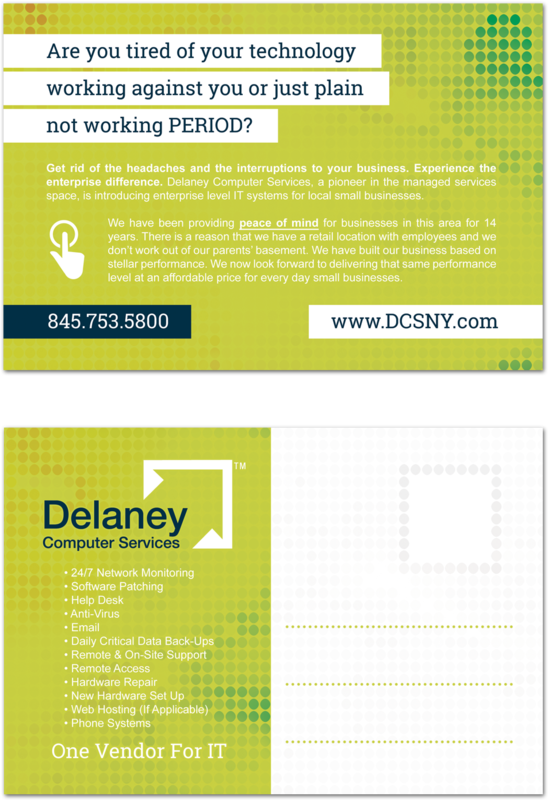 Based in Sloatsburg, New York and a client since 2013; Delaney Computer Services specializes in IT support for businesses. 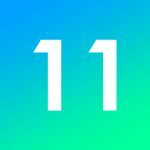 Florida Graphic Design and Printing Company Melbourne FL: Learn about custom print and Florida graphic design services. Local business cards, flyers, postcards, brochures and tri-fold printing company Melbourne FL.